You’re likely to hear this interview question whether you’re a recent graduate or have decades of experience. Employers want to know how you got into your field and why you want to be in this career. They’re honestly curious, first of all. If you’re working as a lab scientist they’ll be curious how you got into it. Did your parents have scientific careers? Did you fall in love with the topic after an introductory course in college? Etc. Then, they want to figure out whether you enjoy the field. Are you passionate about it, or at least interested? Because if you seem like you care, you’ll work harder and overcome challenges. If you don’t seem to care at all, you’re more likely to quit when things get tough. Or come in late. Or slack off. So you DO need to seem like this is a career that you care about it and want to be in. But you DO NOT need to seem like you’re obsessed with it. I get it (and the hiring manager does too) – work is just one part of life. You just can’t seem like you’re miserable or have no interest whatsoever. Now that you know why they ask why you chose this career or this type of job, let’s talk about how to answer. 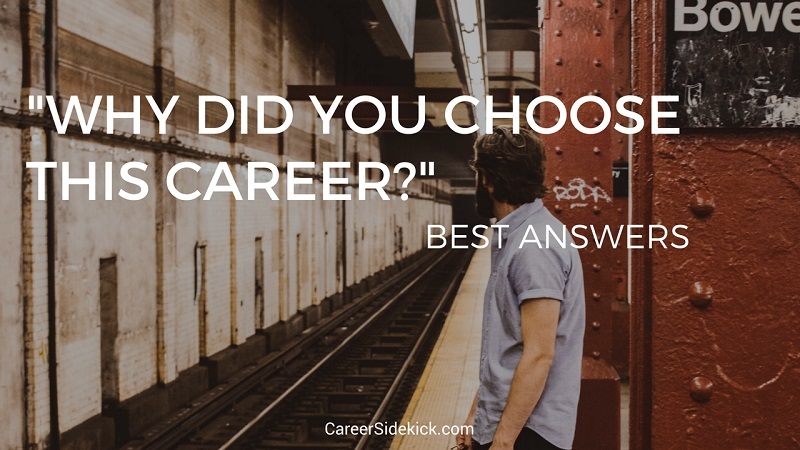 You can give a wide range of reasons when they ask, “why did you choose this career?”… so there isn’t just one correct answer. These 8 bullets below are all great examples of answers you can give. My suggestion is pick whatever’s closest to the truth for you. That way you’ll be more comfortable and confident when answering. Whatever you choose, try to end your answer by showing you’re still interested in this career and the work that you do. Don’t just explain how you originally found this career. Show you’re still glad to be doing it! That will put the hiring manager’s mind at ease that you’re still motivated to do the work, and that you’ll be a big success if they hire you. Now let’s look at some word-for-word sample answers for why you chose this career. NOTE: I mentioned this earlier, but just to make it clear – you do NOT have to say you’ve loved this career forever. You don’t need to be some child prodigy. It’s totally fine if you didn’t discover this career until age 20, 30 or higher. Don’t feel pressure on this and don’t lie. I gave you a lot of bullet points earlier in this article of good stories you can tell for why you chose your career. To conclude, I’m going to give you some things you should NOT say. Don’t sound like you stumbled on this career via someone else’s actions, and took no initiative. For example don’t say, “I had no idea what I wanted to do when I was in college so my father told me I should choose biology.” You need to sound like a self-starter, at the very least. Don’t sound like you’re unsure if this is the right career, or that you don’t like it. Why would a company hire you if you don’t sound excited about the work you’d be doing? If you’re unsure about the career you chose, you can go home and talk with friends or family and come up with a plan for what to do. But a job interview isn’t the time to figure it out. You’ll just cost yourself jobs. So sound excited! Don’t say you chose it for money or something that isn’t work-related (unless you’re working in sales. Than it’s okay as part of your reason). We all go to work for money – the hiring manager gets it. But if you say “I chose biology because my friend told me I’d make $100K in less than 4 years,” you’re not getting hired most likely. Don’t say you chose this career because it allows remote work, flexible schedules, favorable working hours, etc. Even if that’s true! While you might be interested in a company for these reasons, saying it to them will not get you hired. They want to see actual job-related reasons you’re excited to come work for them.